Cottontails breed often; a female adult can have as many as seven litters each year if the weather is warm enough and food is adequate. Female cottontail rabbits make new nests for every litter of young, but they don’t put much time or effort into them. The males don’t take part in nest-building or young-rearing at all; everything is left to the mother. The female cottontail rabbit seeks out a safe, sheltered spot in which to build her nest. She will take advantage of a hollow in the ground under a log or a shrub, in a crevice between rocks or even in a depression in a field, a backyard or another open area. If she can’t find a suitable spot, she’ll create one by scratching in the dirt until she has a place about 5 to 7 inches long and 4 to 7 inches deep. A cottontail doe lines her nest with whatever soft materials she can find. Grass is typically an important component of the lining and is found in virtually all cottontail nests. The mother may add other things to the lining including leaves, tiny roots and even bits of paper or other trash. When the birth is imminent she will pull soft fur from her underside and use it as the inner lining for the nest. 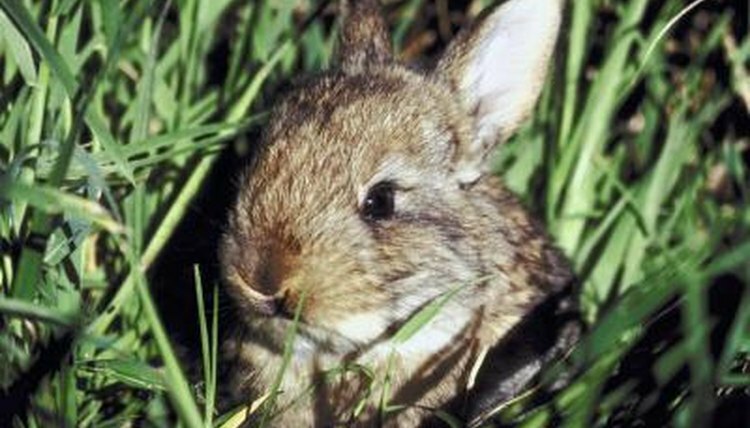 A cottontail litter will have one to 12 babies; typical litter size is three to six. The young are born deaf, blind and without fur. They are completely helpless as newborns, but they develop quickly, leaving the nest at 2 weeks of age. Cottontails can take care of themselves by the time they are 3 to 4 weeks old. Before they reach that stage the cottontail doe nurses her babies a few times every night and pulls some of the nest’s lining over them when she leaves. Mother rabbits don’t spend much time with their young and are not in their nests except for the brief periods when they are nursing. The young get no protection from predators, so many fall victim to dogs, cats and wild carnivores. The shape of the cottontail nest makes it vulnerable to filling with water, so many more young are lost that way. About half the babies that are born survive long enough to hop out of the nest, and only about half of those live more than a few months.